Current thinking is to create a level and lawned area within the bounds of the post Dissolution walls, the green shaded area above. Whilst columnar trees were considered for planting on the site to depict the location of the nave pillars (and as they grow give a sense of the scale of the original nave) this now looks unlikely due to risk damage to the ground archaeology. Via a north door leading into the parish churchyard. 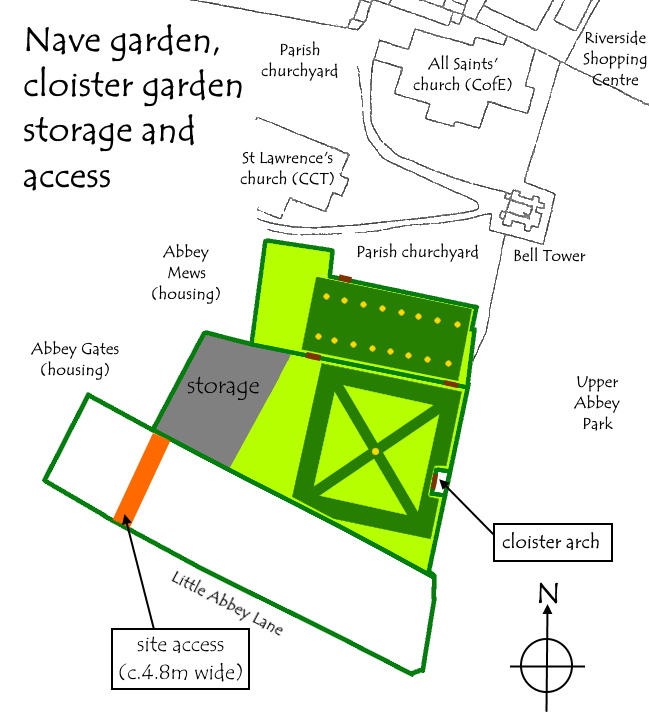 Access from the Cloister Garden will require a ramp for disabled access as well as a short flight of steps. 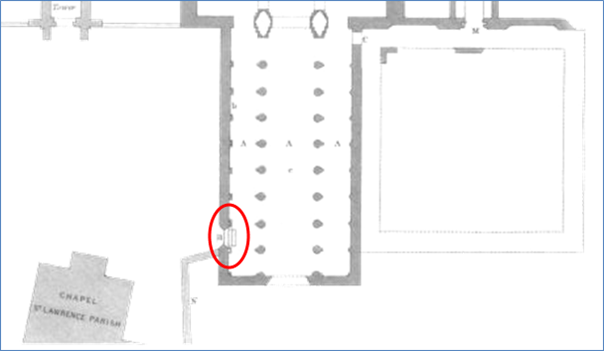 It is intended that the position of these access points will recreate the original doorways leading from the nave into the cloisters. David Cox records that the doorway was in the second bay from the west and had a clear opening of 8.17 ft (2.49 m). Its arch towards the churchyard had three orders, of which the outer two were supported on nook-shafts with narrow bases. He goes on to observe that: “There was nothing to suggest that it was other than the original doorway.” It is planned to recreate this entrance, currently a wooden doorway, as an exit from the Nave. Interpretative panels will be added at specific locations to the site. There are already a number of such panels located in the parish churchyard and in Abbey Park. Arguably the style of these panels is a little dated, but they do have a “house style” which helps provide a sense of unity across the area. The perimeter of the nave to include good quality wooden bench seating at selected locations. A number of wooden benches were installed in the parish churchyard in 2015 made of high-quality hard-wood. These might be used as a model for new benches in the nave garden. The abbey nave was the normal burial place of the abbots  and some of these were uncovered in the 19th century excavations. Sculptural or planting could be used to commemorate or mark such burial places, or to mark the location and dedication of abbey altars and chapels (or, indeed, any other interesting finds from the archaeological work). Measured from Rudge, Memoir (as n. 2), pl. LXVIII (fig. III), D.C. Cox, ‘Evesham Abbey: The Romanesque Church’ (Journal of the British Archaeological Association (JBAA), vol. 163 (2010)), p.49 (pp.24-71). T. Habington, A Survey of Worcestershire, ed. J. Amphlett, II. i, Worcestershire Historical Society (Oxford 1896), 88-91. D.C. Cox, Evesham Abbey and the Parish Churches (Evesham: Vale of Evesham Historical Society, 1980), p.6. D.C. Cox, ‘The Building, Destruction, and Excavation of Evesham Abbey: a Documentary History’, Transactions of the Worcestershire Archaeological Society, 3rd series, 12 (1990), pp.132-34.